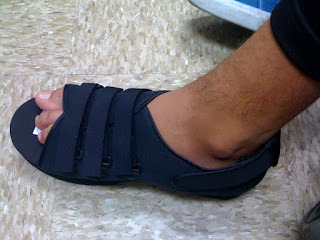 Matty dislocated his second toe on his left foot. Don't ask. It's a boy thing. Anyways....the toe was at a gross crooked angle when I got home. I immediately took him to the doctor. 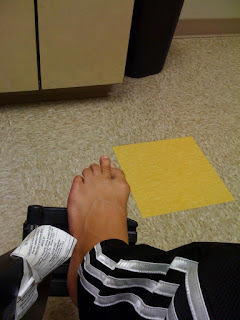 Xrays showed the toe wasn't broken, but badly dislocated (one bone completely underneath the other). Ewww! This is actually a good photo. Be thankful I didn't take the shot from the right. It was really gruesome. The doctor injected Matty with Lidocaine and waited for the toe to become numb. 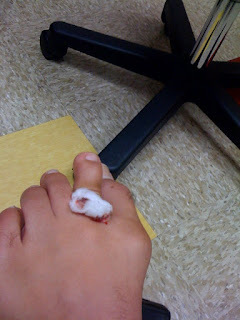 Then....a sports medicine doctor came in and yanked the toe back into place. Matty had to get another xray to make sure the Dr. didn't fracture the bone while manipulating it. Xrays showed everything was back in order. Now Matty gets to wear this lovely shoe (look familiar Sarah?) for the next two weeks. How on earth??!! Didn't he screw up his knee right before school started last year? That was the week before 6th grade. Like I said, it's a boy thing. Get ready!